Georgette Heyer - 50 + works in varying genres. Rosemary Sutcliff - 60+ works in varying genres. Dorothy Sayers - 139+ works in varying genres. Let's not even try looking at Rudyard Kipling. Some writers write A LOT. You look at their work + their lifespan, and you think, "These people must not even stop to poop!" NONE OF MY EXAMPLES EVEN HAD COMPUTERS. You stare at your manuscript that you've been working on for the past five years and you DESPAIR. In the Christian culture, I think in some ways this pressure to create is magnified because it's seen as a "ministry" (that word in itself has many ills to answer for). We feel the pressure to create art that is true + meaningful + opens up the mysteries of the kingdom through fantasy (?? ), and all that sounds good because truthful art is a good thing. We need to flood the reading market with Scripture-based fiction that isn't too preachy, because we need to take back ground + win souls + be a witness + write, write, WRITE. That sounds good. But is it? Is it, though...? "these our hells + our heavens, so few inches apart, we must be awfully small + not has strong as we think we are"
If you think you're going to look at the Penslayer Girl's bio + read about how she's writing for the Lord, YOU WOULD BE TOWERINGLY MISTAKEN. 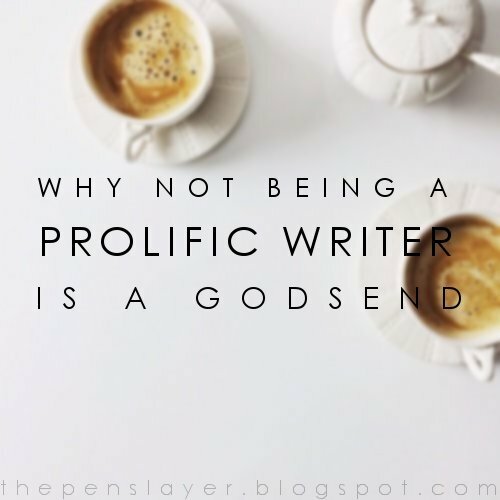 I am not writing for the Lord. And you probably shouldn't try it either. It is a horrendous piece of cheek which has crept into our culture, and found a nice nesting place in girls' blogs. You know the phrase: "daughter of the true King! writing for the Lord!" You might even have that as your own bio. I'm sorry. The Lord doesn't need you + you don't know what you're talking about. | If you possibly think you know enough to "write" for the Lord, you know nothing of the smallness of man nor the immensity of God. Do as Job did, and put your hand over your mouth. Be humble. God has left his written witness. My fiction - your fiction - none of it is necessary. "the best things which we do have somewhat in them to be pardoned"
Art < God | It is true that art, in its accuracy, will be a truthful representation or exposition of reality. That is a beneficial thing to man + it is wonderful that God gave us the capacity to see the world more clearly through a microcosm of creativity. But art never - and will never - hold a candle to the revelation which God himself has given, and we are dangerous fools to suppose we can add to the impact of the simple scripture with our poor, uneducated, proud, silly, childish, fanciful stories. You may smell less of smoke in the judgment than others. | Every work I create, from "Plenilune" to my dying manuscript, will be held up in the last day and examined. I can already tell you their peacock feathers will be burnt. I can already tell you they have a great deal of chaff to be beat out of them, too much earthiness to be any spiritual good. There is too much of my old man in them. What good they may to do the souls of others, I pray to God that may be abundant. But everything in them which is not worthy of God will be stripped out of my soul - and it will not be pleasant. "Take comfort in your smallness." | Don't be hell-bent on writing a lot. Write well. Write truthfully. Write humbly. But don't strive to get to the gates with a mountain of work which will only be burnt up as stubble. Yes yes yes thank you!! Stuff I've tried to say before but couldn't find the words. I'm definitely glad this post has sparked more thoughts in others. Unfortunately, it really, genuinely baffles me that so many of you came away feeling hurt and "rubbed the wrong way" and "feeling worthless." I come across strong in many points on my blog because hitting hard is what I do in this loud, cacophonous internet. It takes a LOT to make oneself heard. But I'm also careful to weave encouragement through my posts + end on a GOOD note. A) the title of this post was highlight a GOOD thing. B) this post lifts a heavy burden off many of us who are still trying to find our footing as writers. C) I COUNT MYSELF AMONG THOSE WHO NEED TO BE ADMONISHED, SO I'M NOT PICKING ON ANYONE. You're going to read hard knocks from me sometimes. Hard knocks are part of life. But I do it to shake people up and get them to take a good hard look at what they (may unconsciously) think so that they can figure out where they really need to be. If this is uncomfortable, //that's what hard knocks feel like.// But I don't do it hatefully. If I did it hatefully, I would just condemn everyone but myself and not even leave a word of encouragement at the end. I myself wasn't hurt by your post, and I hope I didn't come across that way! (I also hope my response was respectful--because I certainly meant no disrespect.) And I have to say that I appreciate the fact that you deliver hard knocks here. Encouragement is wonderful and needed, but certain well-placed knocks have done me MORE good than certain affirmations. Sometimes a good shake is the only thing that will help us mature. I think what gave me pause was the part left unsaid? And your reply to Sarah below actually cleared some of that up for me. ("God doesn't need our fiction to proclaim His Gospel.") My fiction will never save souls or deliver salvation. It's not meant to. That's God's job. But He may use my fiction (written free from the burden of trying to BE the Gospel, as you said!) to affect someone. And that is incredible, not mention incredibly humbling. There have been many, many books that have--in the process of enriching my life--made plain something I hadn't known or realized about God/life/myself/faith before. That's the beauty of fiction, or maybe more accurately the beauty of the Holy Spirit using something like our flawed fiction. These books weren't trying to BE the Bible or BE the sole means of saving someone. Yet they all did something important in building my faith. I know what you mean by the mantra of “representing God” that pops up in every area of the internet. With social media, it is so easy to be seen, heard and published and (especially young girls I think) fall prey to obviously being self focused, untrained and immature with their attempts at art... and then when they say "For His Glory!".... well, that just makes it all the worse. So just for conversation- God doesn’t need us in the least, but He is (or can be) pleased in us. He sees every word you write and has His own opinions about them. And if writing is a calling for you and me, we will feel His pleasure when we do it well. I do agree that a lot of terrible art is passed off as acceptable because people say it is "for the Lord." It is an embarrassment to the Christian community, our witness, and our basic identity as the people of God. If anyone should be pushing themselves to do better, to work harder, to be more truthful, to excel and achieve and move from glory to glory, it should be us! "That is a beneficial thing to man + it is wonderful that God gave us the capacity to see the world more clearly through a microcosm of creativity." - so if anyone comes away from this post feeling that I don't put a premium on our natural inclinations within art and our achievements therein, I am really not sure how else to make that clear. But in the context of the Gospel, //our fiction is not necessary.// God's word, and the simple preaching of it, is sufficient for our souls, their salvation, + their sanctification. Art enriches man's life, whether saved or unsaved. But the word of God alone can make a dead man live. This removes an impossible burden from the Christian writer, puts him in his context as a creative, and liberates him to simply write to the best of his ability and pray, God willing, that his work, like all good art, will enrich others lives. Oh, I see. I missed 'the needed for salvation' part. Probably because I have never felt that way. I guess I grew up with an understanding of God's sovereignty and bigness. What I struggle with is lack of confidence- does anyone really care? Do my words really matter? Learning to see creativity as a spiritual discipline has given me boldness and happiness in the work of my hands- from writing to weeding a garden bed. But I suppose there must be a good number of authors/artists who pump out tons of work in an attempt to save people. I wonder if the real reason isn't just that they enjoy it and the glory of it? I guess my main problem is I doubt myself (and my writing) enough, even though I write because I want to and not to put in a particular message, that I don't need help from "hard knocks" (I know some people do, though!) to get me to think my writing isn't important because I'm already kinda there... I think I see what you're trying to say though, at least in part. Are You a Tear-Jerking Hack?